All modern technology – computers, phones, satellites, cars, and even such simple things as blinking toys – rely on programming! Knowing how to program is an incredible useful skill, but getting started can be quite intimidating. Programming is all about logical thinking, and just about anybody can learn how to code. However, it is difficult to know where to start, and if you ask someone that is experienced they may be talking right over your head. Both my older brothers do programming in the work as engineers. You would think I could have learned it from them, but they always just scared me off and made me feel stupid. Except from taking one university course in “C” programming, I am self-taught. I am certainly no expert (yet), and I strive to continuously improve and widen my skills. If you have never done coding before I suggest you start with Scratch. It will guide you through the logic of coding and start in a really fun and simple way. It is developed mainly for kids, but it is a great introduction to programming for any age! I really enjoyed creating little games and brushing off my logical thinking. 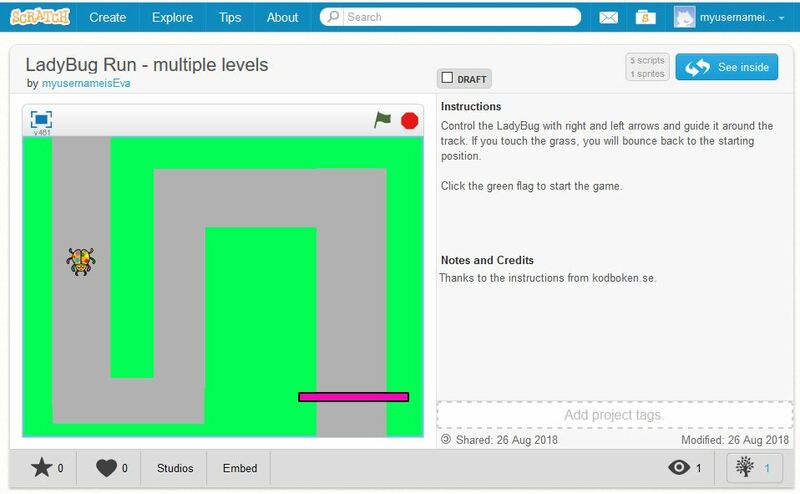 There is a guide to getting started with Scratch here, but it might be more fun to just jump straight into programming a game. 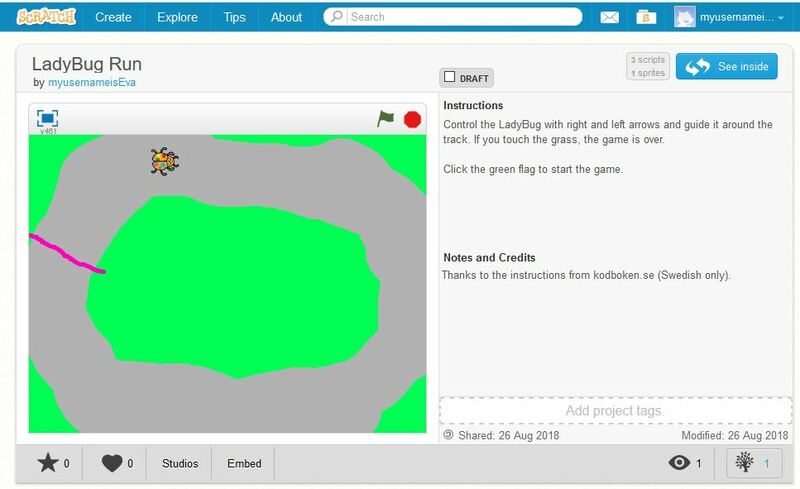 My favorite tutorial is the “Running Beetle” Game starting on page 9 in “Teaching Scratch” by Thomas Arts. The same tutorial is available in Swedish here (Scratch itself is available in many different languages). If you want to see my first attempt to program using Scratch, check out and play my game here (screenshot below). My very first computer game programmed in Scratch! This was a really fun Sunday afternoon activity, and I got completely hooked on making the game more sophisticated. My second version had two competitors – the Lady Bug and a Dinosaur. You will find it here. 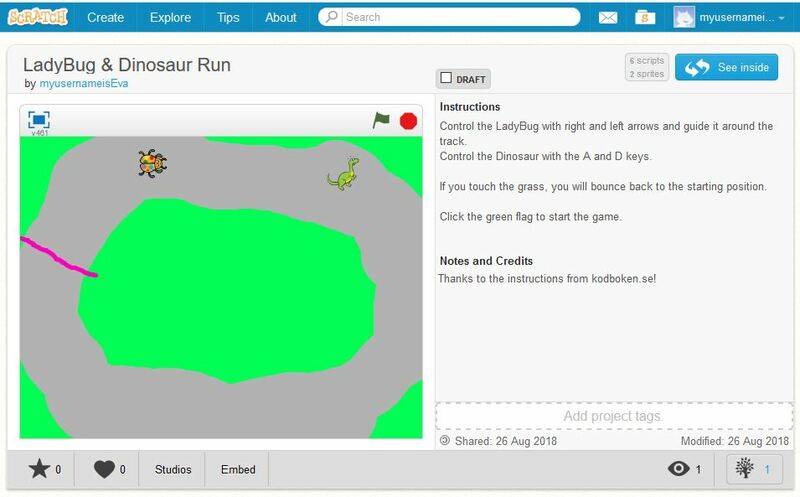 My second computer game is for two people, and includes a Lady Bug and a Dinosaur racing on the same track. The instructions also suggested that I might want to add a second track, and I couldn’t resist that. Here is my version with two tracks and a “Game over” screen. My third version has two levels. Learn to code with "Scratch"
DIY: Take professional quality photos of yourself! 3D printed C-clamps - handy for all your projects! A $200 3D printer - that works! Articulated 3D prints - fun and easy!